Large, All-Glass Mister. Table Top Model With Color Changing Lights. Stuff Points: Earn 72 points when you buy this stuff. The thick glass bowl is more square than round, but it doesn't have sharp corners, or any straight lines. A curvy outer edge softens the geometric shaping to create a simple design with a modern feel. The heavy weight glass bowl has a flat, square bottom, and is pre-drilled on the side to allow the cord to thread through. In the center of this fountain, you will find a top quality mist maker with color changing LED lights. A holder supports another glass piece that is elevated above the mist maker to catch any splashes, and keep all water in the bowl. It has a long cord that plugs into any standard outlet, and all you need is regular water to start making mist. 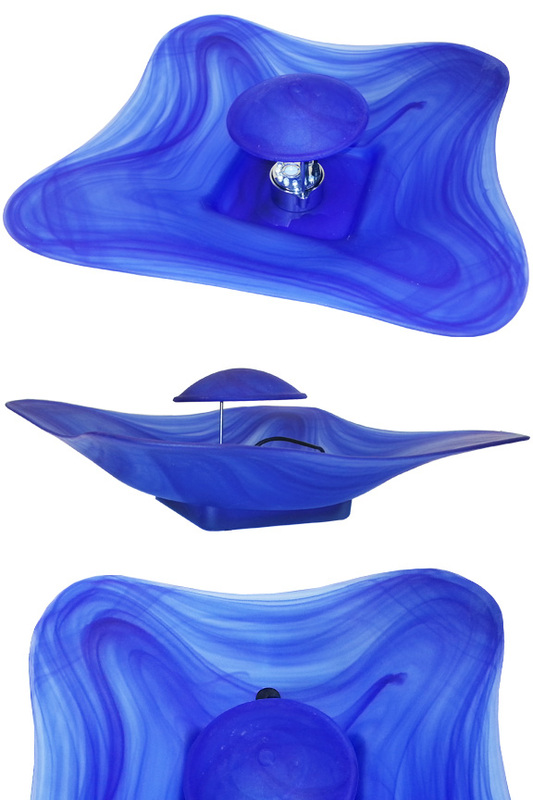 Simply fill the bowl to capacity, and turn on to generate a thick fog, and watch the lights glow and change colors. The large 16" bowl is bigger than most table models, and will allow you to go longer between fill ups. It's an eye catching decoration, but it also doubles as a humidifier, lamp, air purifier and deodorizer. High Quality. Thicker glass and a better mister make this model look better and last longer. Large. The bowl on this model is normally reserved for floor model fountains. A 16" diameter provides more capacity than most table top options. Natural. Add moisture to the air, or make the room smell nice without any chemicals or fancy contraptions necessary. The simple action is safe, gentle and simple. Beneficial. Great for plants, people with allergies, anyone with asthma and more. Increase humidity and clean the air at the same time. It isn't dry ice, and you don't need to add any chemicals to the bowl. The cloud generated is pure water vapor, and it is produced in a very natural way. The device in the center of the bowl is basically evaporating the water in the bowl to make a cloud that floats on top of the water. Once filled it will begin to float out, and mix with the air in the room. It acts as a cool mist humidifier, but you can also add essential oils to the water to add fragrance at the same time. As a byproduct of the mist production, negative ions are generated. They cling to dirt and pollen in the air to neutralize them and leave it cleaner. Because it has a ring of lights that are different colors, it gets pretty bight, and rotates through several modes to give it a great look. A low water sensor is built in to prevent operation when the level runs low, but just add more to make it turn back on again. Dimensions 16" x 16" x 7"
Large capacity table top mister. Decorate a room, and add a humidifier and air purifier at the same time. The larger bowl increases time between fill ups. Order Yours Today! extremely happy with seller and product.